BRISTOL - It took more than 10 innings, but the Bristol Blues escaped with a victory over the Nashua Silver Knights Thursday, winning via a home run derby. 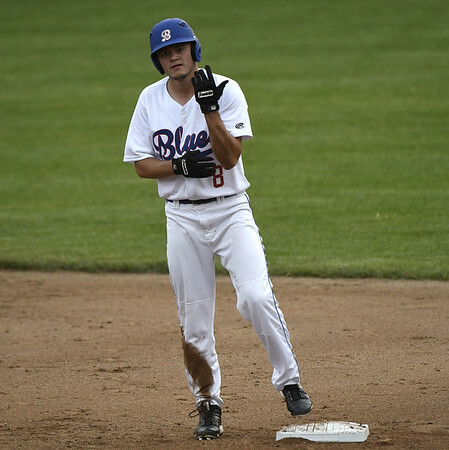 Center fielder Connor Nolan was the hero of the night, hitting six home runs, three in each round, to help the Blues beat the Silver Knights 1-0. Michael Genaro had another solid start, going seven innings, giving up seven hits and striking out three, without surrendering a walk. Genaro has 12 shutout innings to begin the season. Emmet Sheehan came in out of the bullpen, striking out four in three innings of work. The Blues managed just three hits throughout the game, two of which were from second baseman Andrew Hague. It was Hague’s first appearance at the plate this season. Blues batters combined to strike out 14 times in the game. Bristol moves to 7-1 on the season, with their next game being Friday night against the Brockton Rox. Posted in Newington Town Crier, Bristol Blues on Thursday, 7 June 2018 22:06. Updated: Thursday, 7 June 2018 22:08.